Although I’d heard of Katsushika Hokusai before and I’d seen a couple of his paintings and prints, I hadn’t really read about him in any detail until a couple of days ago when I was randomly clicking interesting links on Wikipedia. Anyway, as soon as I started reading the article about him, I was absolutely fascinated. As well as being an amazing artist, his life story seemed to be amazingly inspirational too. So I thought that I’d write an article about five things that artists can learn from Hokusai. Katsushika Hokusai was a Japanese artist who lived from 1760- 1849 and produced a fairly large number of drawings, paintings and woodblock prints. His most famous prints are probably “The Great Wave Off Kanagawa” and a certain infamous picture called “The Dream Of The Fisherman’s Wife” (Google at your own peril! ). Not only that, he published fifteen volumes of sketches called “Hokusai Manga” (not to be confused with the type of comics of the same name). 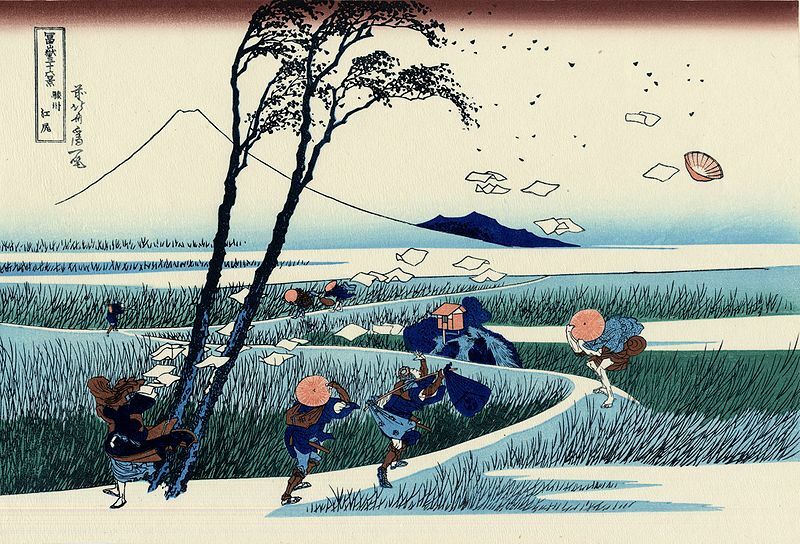 So, what can Hokusai teach us about art and being an artist? 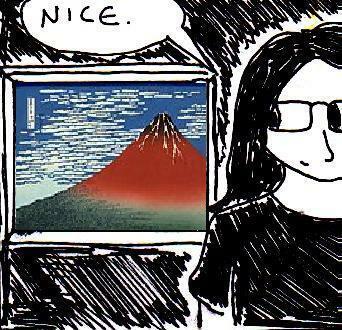 As you can see, Mount Fuji is represented by just a single line. That’s all. Yet is is still very clearly recognisable as a mountain and it serves very well as a background too. Using simple backgrounds is a fairly basic artistic technique which both helps to emphasise whatever is happening in the foreground and allows you to draw more quickly too (something that is incredibly useful if you’re drawing webcomics). Drawing good simple backgrounds is a skill which is fairly easy to pick up too – since all you have to do is to draw the outlines of whatever is on the horizon. It’s really that simple and, when it’s done well, it looks extremely professional and dramatic too. 2) Never rest on your laurels: I quoted some of Hokusai’s last words in the introduction to this article and it’s amazing that, despite his fame and longevity, he still lamented the fact that he wasn’t a “real painter”. This might sound fairly depressing at first glance, but it’s actually extremely inspirational when you think about it. For starters, many artists and other creative people tend to feel that their work “isn’t good enough” when compared to more famous and well-renowned creative works. Well, even famous artists think the same things about their own work too. It’s nothing to be ashamed of. From his last words, it’s pretty clear that, even when he was staring death in the face, Hokusai never rested on his laurels. He never believed that he’d reached his peak as an artist and, even when he was famous, he was always striving to improve his own work rather than just churning out the same things over and over again or smugly basking in his own talent and fame. Yes, resting on your laurels for a short time can be very satisfying, but if you really want to be a great artist then you should always feel that there is room for improvement. 3) Make a lot of art: In his lifetime, Hokusai produced an enormous amount of drawings, paintings and prints. Whilst it’s fairly well-known that becoming even a vaguely competent artist takes a hell of a lot of practice, it needs repeating. If you are an artist, then you need to produce as much art as you can. As well as having a large collection of art to show for it (even if you drew one simple picture every day, you’d have over a hundred of them in less than four months), producing a lot of art can also be a great inspirational tool. I’ve written about this before, but there is something incredibly satisfying about looking at your old art from a year or so ago and just noticing how primitive it looks when compared to your more recent art. 4) Variety: If there was one thing that Hokusai was good at, it was variety. As well as painting a large range of landscapes, he also produced huge numbers of different drawings too. In short, he produced a wide variety of drawings of a variety of different places, people and situations. Whilst it’s very easy to get comfortable with drawing the same type of drawings and the same types of characters and settings (I do this all the time – it was one of the reasons I started my “How To Draw” series, so that I could practice drawing new things), if you want to become a great artist, then you have to keep practicing drawing things which you haven’t really drawn before. If you’re not sure about how to do this, then check out an article I wrote about this subject a while ago. 5) Follow Your Fascinations: Although Hokusai drew and painted a variety of different things, he was fascinated by Mount Fuji. In fact, he was so fascinated by it that he made at least 46 prints which featured it in some way or another and this is a good lesson for artists in general. In other words, it’s totally ok to follow your fascinations – in fact, it is essential for truly great art. But, going back to the last point on this list, even though Mount Fuji appears in quite a few of Hokusai’s prints -each of his prints are very distinctive and different from each other. So, remember, it is ok to follow your fascinations, but you shouldn’t use it as an excuse not to try drawing and/or painting different things at the same time too. This entry was posted in Art and tagged Art, creativity, Hokusai, inspiration.